Greg Yost, with his banner, in Harpers Ferry. Follow his progress here. Not many people accidentally walk 30 miles in a day. 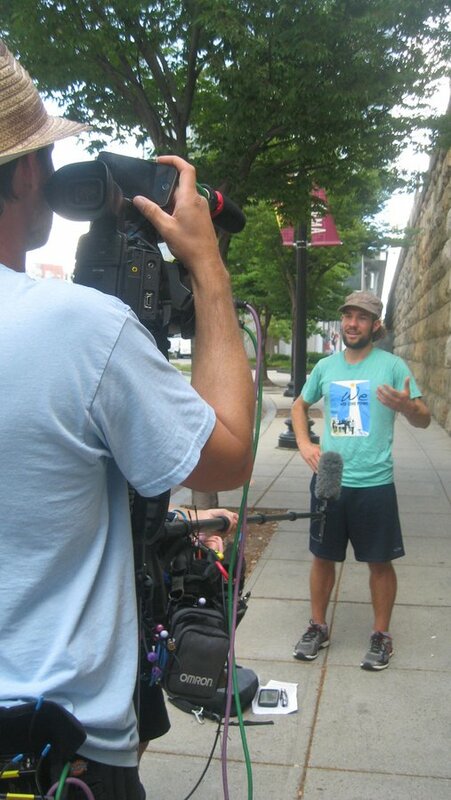 But that’s what Greg Yost has done on occasion as he heads south along the Appalachian Trail. More than halfway now, he should reach Springer Mountain in Georgia before year’s end. He walks with a sense of urgency, not only to get back to his family near Asheville, NC, but to talk to people about the climate crisis. Most thru-hikers, those who walk the full 2,190 miles in one continuous journey, take on this arduous yet stunningly scenic trip as a personal challenge. Greg did that sort of walk in 1989. The inspiration for that hike occurred in the summer of 1987 when he was working at Habitat for Humanity in Americus, GA. That February, National Geographic had published a fascinating article on the Appalachian Trail. Thru-hikers have their picture taken and record their start date, trail name and contact information for notebooks kept at the Appalachian Trail Conservancy in Harpers Ferry. Greg fills in his information next to the 1989 notebook with his image. Greg, at left, in 1989. This time, however, Greg talks with anyone who will listen about fracked gas, climate change, methane leakage, and the dangerous buildout of fracked-gas infrastructure. The Greg this trip is a different person, he says. Greg’s daughter, Anna Farlessyost, proposed the walk. The last-minute – less than three weeks to prepare – father-daughter adventure was to be part of Anna’s gap year. After numerous injuries in Maine and many “0-mile” days, Anna reluctantly decided to take a bus home Aug. 10, less than a month into the trip. She’ll resume her walk in the spring. Greg carried on alone. 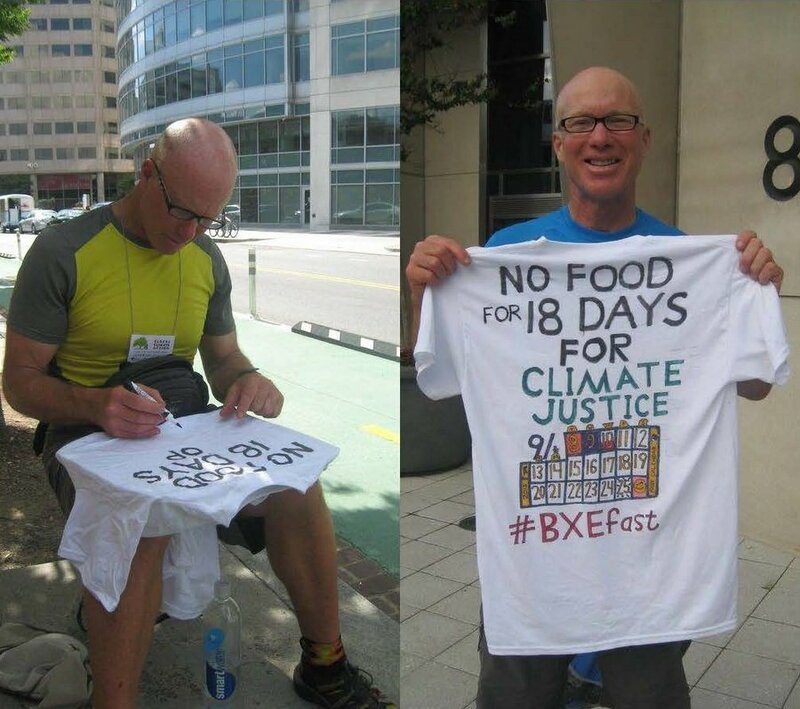 Greg, however, chose for his trail name BXE, the abbreviation for Beyond Extreme Energy, a nonviolent climate group that uses direct action to try to stop dirty energy projects – for oil, coal and fracked gas – and to promote clean energy from the sun and wind. 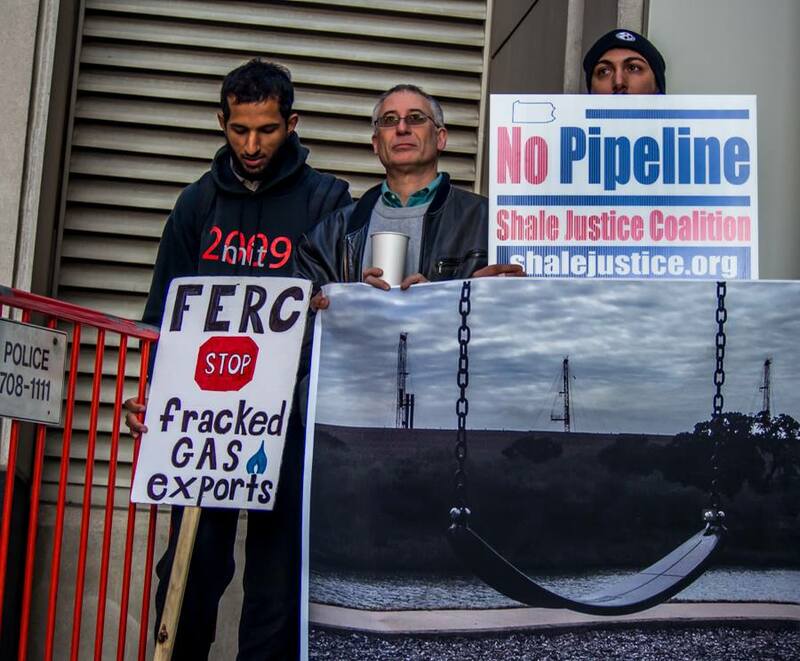 BXE focuses on the Federal Energy Regulatory Commission (FERC), which approves nearly every fracked-gas project that comes before it. 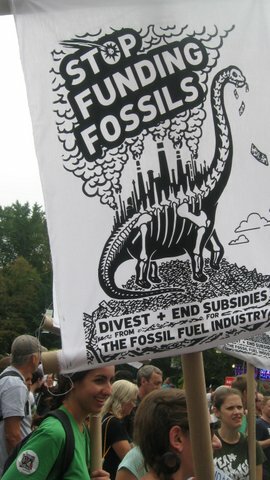 The group also supports front-line struggles, such as in Lusby, Md., where a fracked-gas export facility is being built at Cove Point; in North Dakota, where Native Americans and their allies are trying to block the Dakota Access Pipeline; and a host of communities battling pipelines and compressors, particularly in the Northeast. He’s also seeking sponsors (21 so far), who will pledge to donate a cent a mile ($21.89, or more is welcome) to Beyond Extreme Energy at the conclusion of his walk. Greg posted this photo on Facebook at mile 1000.1 on Oct. 3. When he introduces himself, the question invariably arises: What does BXE mean? And that’s how Greg starts these conversations. By Day 53, he posted on Facebook, he had already had at least a couple hundred face-to-face conversations. And then it happened. A 12 year old girl made my day. Maybe even made this whole trip worthwhile for me. Eyes alight, she threw her fist in the air in an act of spontaneous, irrepressible emotion. Eye contact was total. She got what we are doing. They all did, really, in that moment. What they saw: We have power. And it’s right when we use it. Greg reached what was formerly the halfway spot Oct. 8; the trail is frequently rerouted, so his halfway point was still ahead. 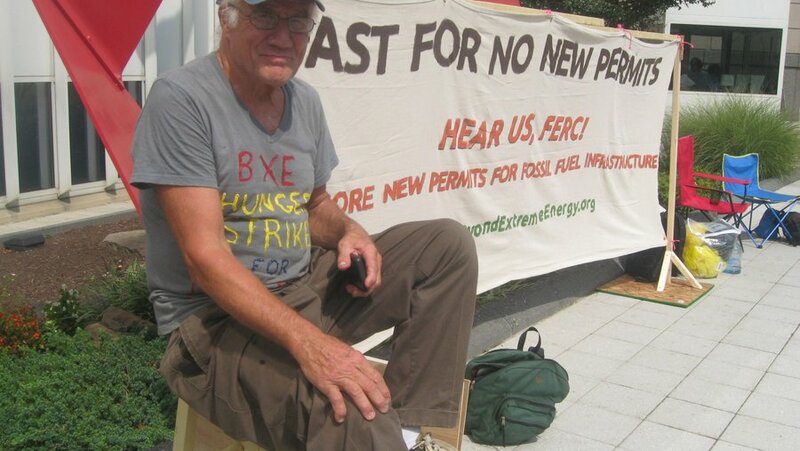 Sometimes he meets “courageous folks fighting pipelines, compressor stations.” Tom Denny, for example, is fighting a 650-megawatt gas plant being built near his home and is mere miles from the controversial Minisink, NY, compressor station that was completed a few years ago. Denny’s “point of entry,” Greg wrote, was not a public meeting. 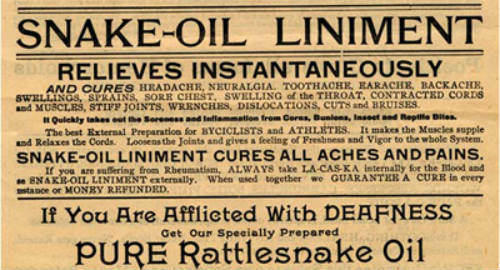 It was severe headaches that his doctor couldn’t explain. Greg has decided that hiking south is by far the better way to go. It’s harder at first: “You encounter the toughest parts right away, when you are not in shape. The trail is instantly hard,” he says. It took him about six weeks to acclimate, including “the matter of losing 30 pounds – any extra weight makes you more miserable than you need to be.” The benefits of going south, starting in late July, are that he avoided the northbound “mob” – there are about 15 or 20 northbounders for every southbounder – and, for the most part, the black flies that greet northbound hikers in New England over summer. His hardest days came in early September in Connecticut, during days of drought and high humidity. Places he expected to be able to find water were sometimes dry. 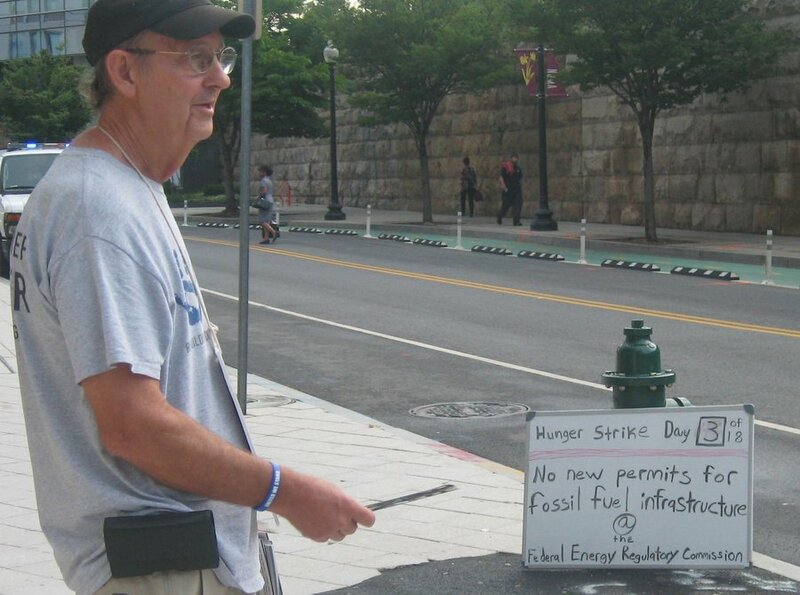 One day, he had to hike 6 or 7 miles without water. “My clothes were drenched from my own sweat, yet I had nothing to drink. This went on for hours, my strength gradually leaving me, literally dripping away,” he wrote on Facebook. Fortunately, at the summit, a water spigot was working. Other days, he relied on “trail angels” who leave water jugs at road crossings for hikers. Most days, he wakes at 5 a.m., sometimes even 4 a.m., and walks until late afternoon, has dinner, and then resumes hiking. As the days shorten, he’s had to turn on his headlamp as darkness falls. 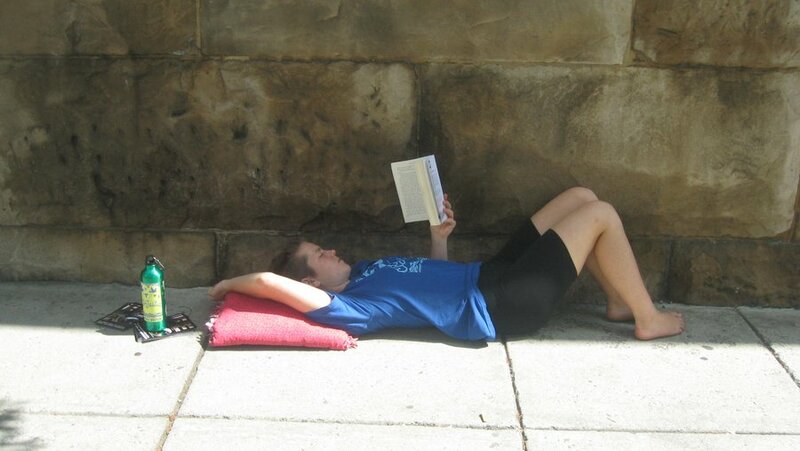 When he’s had enough, he looks for a flat spot, rolls out the sleeping bag, writes his blog entry and sleeps in the open. He’ll pull out the tent only if it rains and he can’t reach a shelter. It was also useful for keeping out bugs in August. Nights are getting cold, but the mummy sleeping bag has kept him warm. He doesn’t sleep that well, mainly because his feet are so painful. Not from blisters but from metatarsalgia. His knees also hurt: “That’s not just me, that’s every hiker,” he says. The mathematician in him loves creating spreadsheets on his smartphone. Every night, he logs his miles. He’s written crude formulas that anticipate what date he will arrive at certain places. His average is picking up – especially given that he logged many days of zero miles while Anna was trying to heal on the trail. So now he knows he’ll arrive in Georgia in 2016. 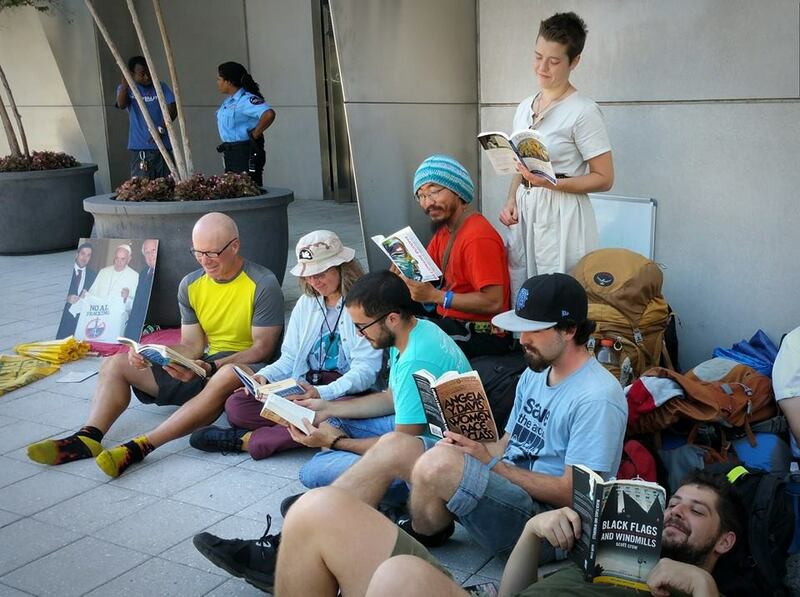 “There’s a chant I’ve heard at many protests and demonstrations: ‘We are unstoppable. 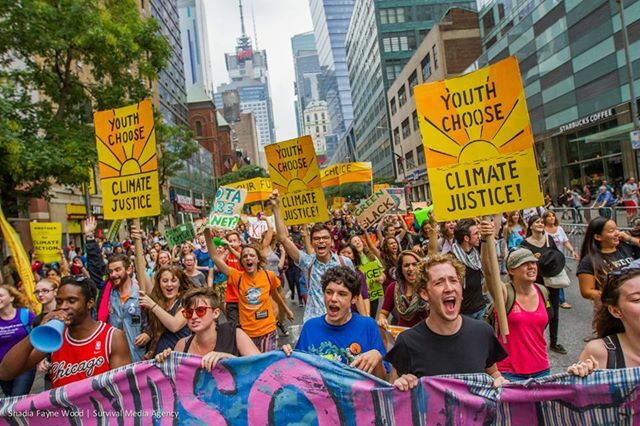 Another world is possible.’ It’s a chant that gives voice to hope that wells up in people, especially young people, when they lose their sense of isolation for a moment in the joy of taking the street with others who share their deep hope and longing. I think of these words often in the mornings on my hike. I recommend them to you, too, to use like a mantra. But I feel it’s important to distance ourselves emotionally, at first anyway, from any image of a crowd chanting exultantly and triumphantly. Rather, say the chant slow and low. Growl it. Get to know the truth of it for yourself. Another world is possible. Do you believe that? I feel myself being changed and prepared by that insistent meditation. And then, ‘We are unstoppable.’ Who are ‘we’, these people who will fight instead of watch or look away? I’ll tell you what, I’ve noticed that when I look for them, I find them. In fact, it’s sadly comical how easy it has been for me to find them. Where’s Greg? Follow along here. At the meeting in McHenry, Gabe Echeverri asked all who supported a ban to stand. And last night, in front of an exuberant and even tearful room of residents, the Town Council of Friendsville in Garrett County voted 5-1 to ban fracking, following in the footsteps of Mountain Lake Park, which said no to fracking in 2011. 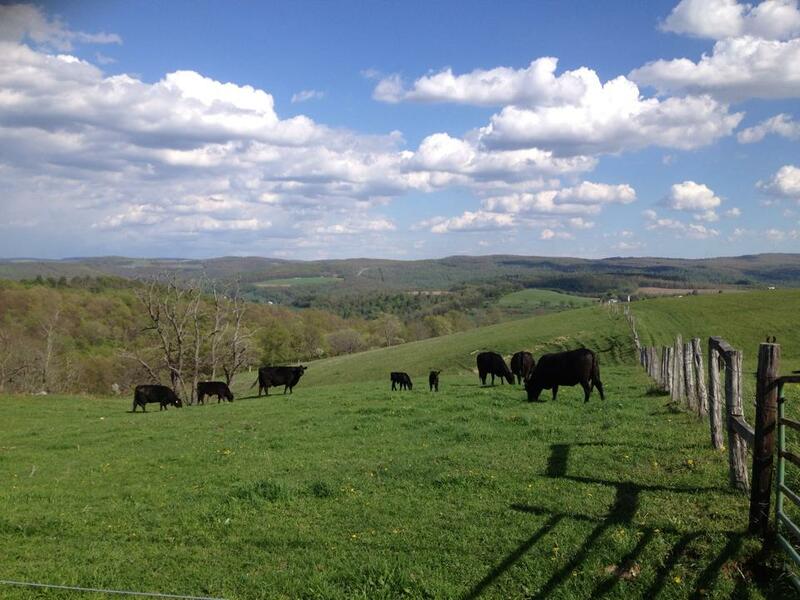 Both towns lie over the Marcellus Shale gas basin. Montgomery and Prince George’s counties, on top of the Taylorsville and Culpeper shale basins, also have put in place local bans. There was much joy in Friendsville when the Town Council passed a ban. 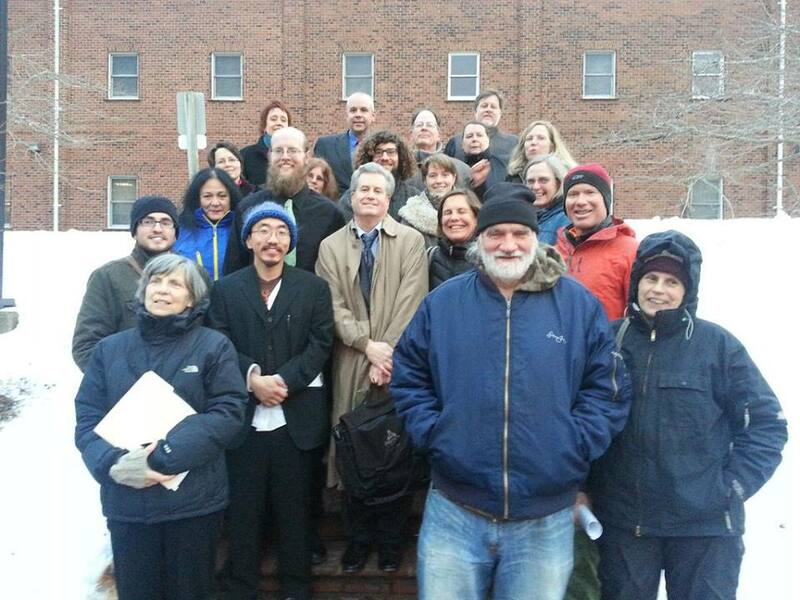 During three public meetings — in Cumberland, Baltimore and McHenry — over two weeks, MDE Secretary Grumbles and his staff got an earful of reasoned testimony and impassioned pleas from hundreds of people, including property owners, realtors and other business owners, health professionals, activists, people who had rejected leasing their land and those who regretted leasing their land, retirees and 20-somethings. 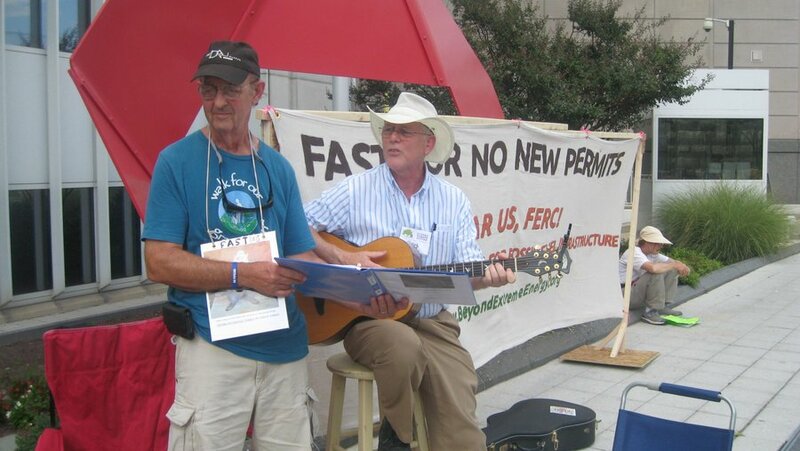 They even heard an anti-fracking song from a guitar-strumming George Polimenakos, an adventure sports guide in Garrett County’s thriving tourism industry. 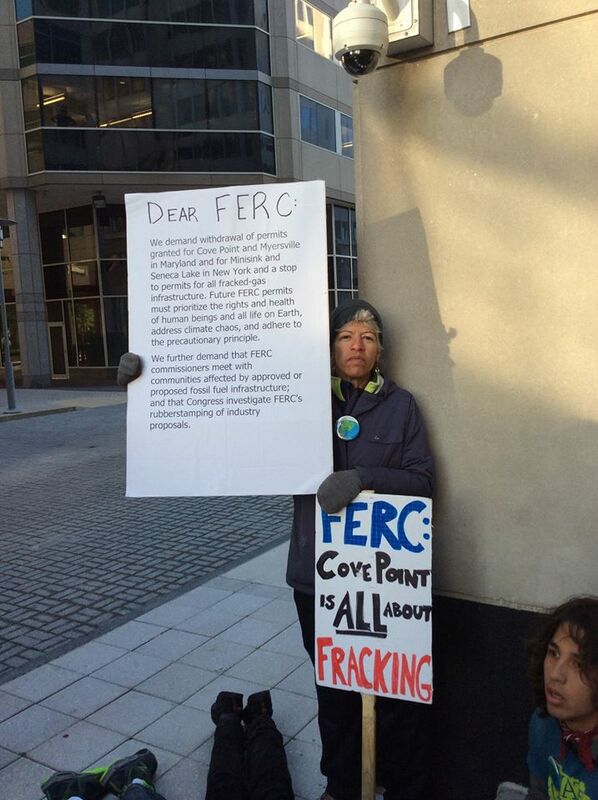 At the Baltimore hearing, a landowner and two gas workers from fracked Pennsylvania issued dire warnings. Before the meeting in McHenry at Garrett College, opponents brought a dog and pony (in truth, a miniature horse) to illustrate exactly what they thought of MDE’s attempt to bamboozle the public with its PowerPoint and talking points. MDE put on a third fracking-regs dog and pony show at Garrett College in McHenry. The issue papers examine four areas from the January 2015 regulations, which were proposed by Gov. Martin O’Malley and then put on hold by Governor Hogan. The Maryland Department of the Environment (MDE) plans to tighten a single regulation — the agency would require a fourth layer of casing around the drill, with all layers of casing and cement running to the surface — and then gut many of the already inadequate O’Malley proposals. MDE would reduce or even eliminate some setbacks so they are “more in line with the requirements of surrounding states,” an unnerving pledge given the ongoing disaster in Pennsylvania — the epicenter of what can only be called a fracking rebellion — and in West Virginia. Fracking could be closer to private drinking water wells, 1,000 feet instead of 2,000 feet. The state would eliminate all automatic setbacks from cultural or historical sites, parks, trails, wildlife management areas, wild and scenic rivers, and scenic byways. From most wetlands, the setback would be 25 feet. “I can spit farther than 25 feet,” said Frostburg resident Gabe Echeverri at the McHenry meeting. If not “feasible,” some setbacks would be expendable, MDE says — all in the name of “enhanced flexibility” and “balance,” as if we were taking a yoga class. 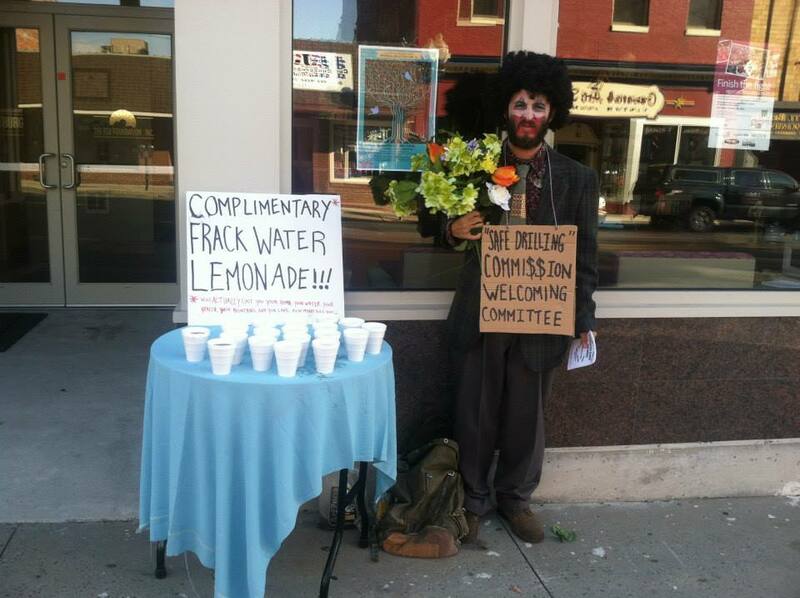 They are designed for “simplification” and “customer service,” but the only customer in mind is the fracking industry. MDE would also eliminate requirements for air monitoring because it is content to use readings from the MDE station at the Frostburg Dam and the mobile National Energy Technology Laboratory equipment. “That’s the same as monitoring Frederick County from the center of Ravens Stadium,” Mary Helen Spear complained at the Garrett College meeting. The proposal conveniently disregards research showing that even existing monitoring fails to detect spikes in emissions that could account for residents’ complaints about nose bleeds, nausea, abdominal pain, and breathing difficulties near fracking operations. Yet MDE’s issue papers are flawed even at their premise, namely that the shale advisory commission concluded in 2014, after three years of work, that “the risks of Marcellus Shale development can be managed to an acceptable level.” The commission reached no such conclusion. It was sharply divided, as were the residents of this state. However, the most recent poll, in 2015, shows opposition increasing, with about two-thirds of those surveyed favoring a long-term moratorium or outright ban. And improving casings, the linchpin upon which MDE walks back even a semblance of protection, can’t resolve the inherent problem of leaking wells. Not to mention the blossoming on yards of replacement water supplies known as water buffaloes, communities relying on church donations for water for years, the difficulty getting home insurance, and the decline in property values. 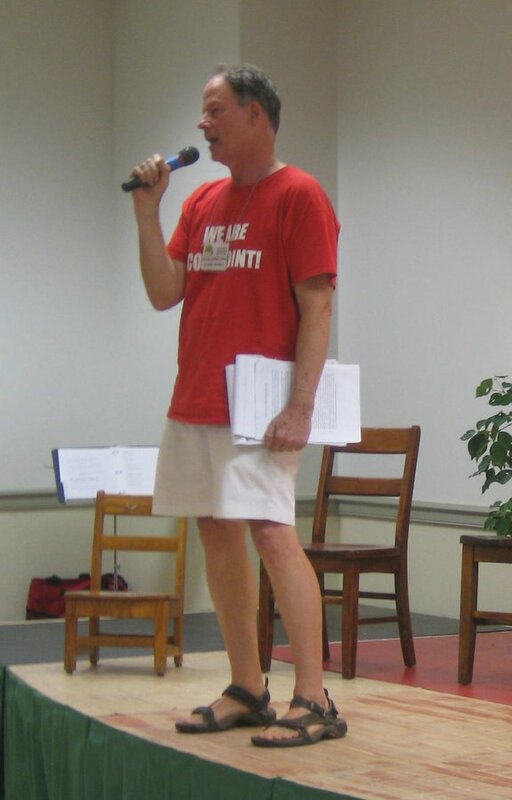 A handful of fracking proponents spoke at the McHenry meeting, such as Bob Paye, an attorney with the Energy and Property Rights Coalition, who characterized opponents as “people who listen to fear-mongering.” Billy Bishoff of the Garrett County Farm Bureau applauded MDE’s proposals while calling for still weaker setbacks. Garrett resident Shawn Bender, a member of the shale advisory commission who works in the oil and gas industry, questioned MDE’s putting any county watersheds off limits from fracking. 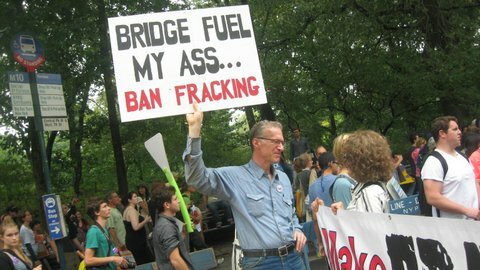 Under the O’Malley and Hogan MDE proposals, fracking would be prohibited in the Broadford Lake, Piney, and Savage Reservoir watersheds. While opponents seized on that restriction to argue that what’s unsafe for those watersheds is unsafe for rest of the county and state, Bender turned that logic upside down — agreeing that if particular watersheds need protection, that would suggest that fracking was unsafe, but then concluding that fracking should therefore be allowed everywhere. MDE has also ignored the ever louder signals of climate gone haywire – the increase in forest fires, droughts, floods, storms, species extinction — as well as the commitment of nations to keep warming preferably below 1.5 degrees C. That can’t be achieved by doubling down on yet another fossil fuel. All this in the name of jobs is the final insult. The blame for the loss of jobs lies with the fossil fuel giants such as Exxon that knew but suppressed the science about climate change. If we had started this transition in the 1970s, the pain – in jobs lost and our health in jeopardy would not be so great now. Email your comments to marcellus.mde@maryland.gov through July 18. Of course, we will also see “positive economic impacts” for physicians who treat people complaining of rashes, headaches, shortness of breath or hair loss. As some of the chemicals used in fracking and the emissions from well pads and compressors are known endocrine disrupters and carcinogens, we might years hence also see “positive economic impacts” for oncologists or hospitals treating babies with birth defects. These regulations are positive only in the sense that hurricanes are positive for builders and car crashes are positive for lawyers. The state’s approach becomes clear here. MDE is comparing the proposed regulations to existing regulations for conventional gas drilling. It is not comparing the regulations to the safety we have now, the safety of not fracking. With these regulations, the state is willing to gamble with the Western Maryland tourism industry, whose growth, according to the state Office of Tourism, is outpacing all other regions of the state. A state-commissioned economic study said it didn’t have enough evidence to calculate the harm to Western Maryland’s tourism business. But it said Garrett, in particular, “is considered one of the most diverse and fastest growing counties in the Appalachian region,” with tourism and demand for second homes a key part of that growth (p. 77-78). It also concluded that: “nonresidents may have more flexibility to avoid Western Maryland if they perceive the local trails, streams, and woodlands to be of lesser quality near drilling activity, ultimately impacting the popular second‐home market of Garrett County” (p. 91). In other words, tourists would likely go elsewhere if they spot replacement water supplies — water buffaloes — on the front yards, or have to hike within a few hundred feet of frack towers, or kayak down a river while compressors drown out the birds, or sit on the deck listening to 24-7 flaring (allowed for up to 30 days under these regulations), or drive while stuck behind a caravan of water trucks. Vacationers won’t like that much. Residents would have to put up with all that, too. Where would they go during an out-of-control frack fire? Or even, as the Southwest PA Environmental Health Project reports, during the middle of the night if indoor pollution monitors spike? In August, the Garrett County Board of Realtors called for a ban on fracking in the Deep Creek watershed. The Realtors group cited research showing that property values near drilling activity fall as much as 27 percent. The Deep Creek Lake watershed provides about 60 percent of the real property tax base to the county, the Realtors group said, generating more than $24 million in tax revenue. “The placement of even a few gas well pads could have a negative effect on that revenue and make it more difficult for many property owners near gas wells to sell their property,” the group said in a news release. “This fracking proposition flies in the face of the entire Deep Creek brand,” advertising executive and illustrator Mark Stutzman of Mountain Lake Park told the state’s shale advisory commission in December, when the public had a last chance to comment on the final report on fracking by MDE and the Department of Natural Resources. “We are being steamrolled,” he said. This is the most cynical and dangerous of the assumptions. These regulations don’t minimize harm from drilling; these regulations would permit harm from drilling. 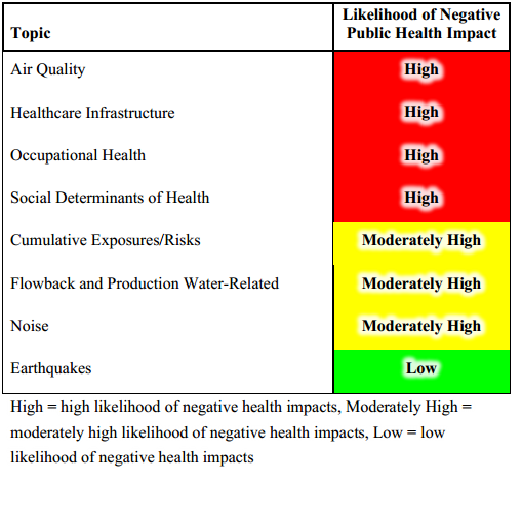 In a report for the state’s Marcellus Shale advisory commission, the Maryland Institute for Applied Environmental Health (MIAEH), part of the University of Maryland’s School of Public Health, found high or moderately high likelihood of harms to public health in seven of eight areas. Regulations have not been shown to alleviate these harms. Local health departments could be on guard for “clusters of symptoms,” suggested Clifford Mitchell, M.D., a member of the state’s Marcellus Shale advisory commission and director of the state’s Environmental Health Bureau. The western counties will also need a health surveillance system, starting now, lest we “squander this opportunity,” according to Donald Milton, M.D., Dr.P.H., a member of the MIAEH team. So, the plan clearly is to set this experiment in motion in yet another state and document the damage. 96 percent of all papers published on health effects indicate potential risks or adverse health outcomes. 87 percent of original research studies published on health outcomes indicate potential risks or adverse health outcomes. 95 percent of all original research studies on air quality indicate elevated concentrations of air pollutants. 72 percent of original research studies on water quality indicate potential, positive association, or actual incidence of water contamination. And the science is just beginning: About 73 percent of all available scientific peer-reviewed papers have been published in the past 24 months, with a current average of one paper published each day. That analysis was one of two key documents handed to Gov. Andrew Cuomo a week before he decided, at the advice of his acting health commissioner, that fracking would not be safe for New Yorkers. The other document was the Concerned Health Professionals of New York’s updated summary of the evidence of fracking’s risks and harms. In New York, public health experts were allowed to make the call. 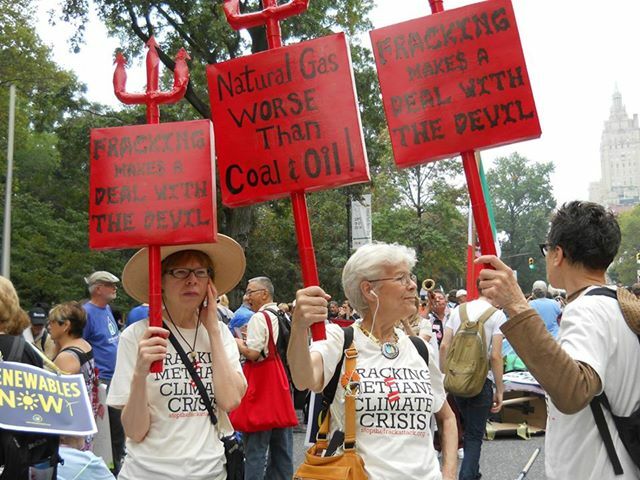 In Maryland this month, a coalition of 61 health, environment, faith and advocacy groups citing the same analyses, called on the state Legislature to approve a long-term moratorium on fracking in Maryland. A group of public health experts and other scientists also called for a lengthy moratorium in Maryland following a daylong conference at Baltimore’s University of Maryland School of Nursing in September. The responsibility for the proposed regulations falls not to MDE, but to its boss, Gov. Martin O’Malley, who — on his way out the door — decided that Maryland could “balance” the risks and rewards of fracking. Even though that is what other states have said, to disastrous results. 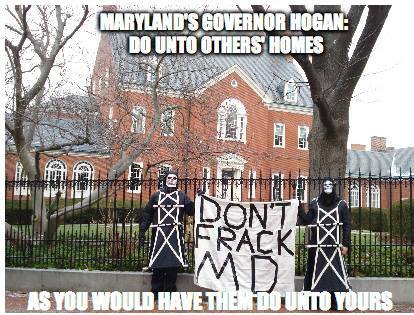 “Based on the available evidence, there is no reason to believe Maryland would be an exception,” Physicians, Scientists and Engineers for Health Energy wrote to O’Malley after he decided fracking was ok. Unfortunately, industry’s thumb has always been on that balance scale, outweighing (except in New York) the accumulating evidence and warnings from the public health community. Including two reports last week: The fracking industry is dumping and spilling ammonium and iodide — toxic to fish, ecosystems, and by extension, human health — into Pennsylvania and West Virginia waterways; and West Virginia is studying a threefold increase in gas-industry worker fatalities from 2009 to 2013, during the fracking boom. In recommending that New York not allow fracking, acting Health Commissioner Howard Zucker found too many gaps in research, likely harms to public health, and too little evidence that regulations would prevent harm to public health and the environment. 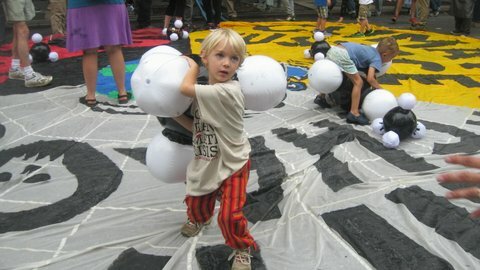 Fracking is not safe for New Yorkers. It’s not safe for Marylanders. Or Pennsylvanians, or West Virginians, or Coloradans, or Texans, or Ohioans. Or anyone. Regulations are merely a way to make those with power appear to be safeguarding the public while doing no such thing. 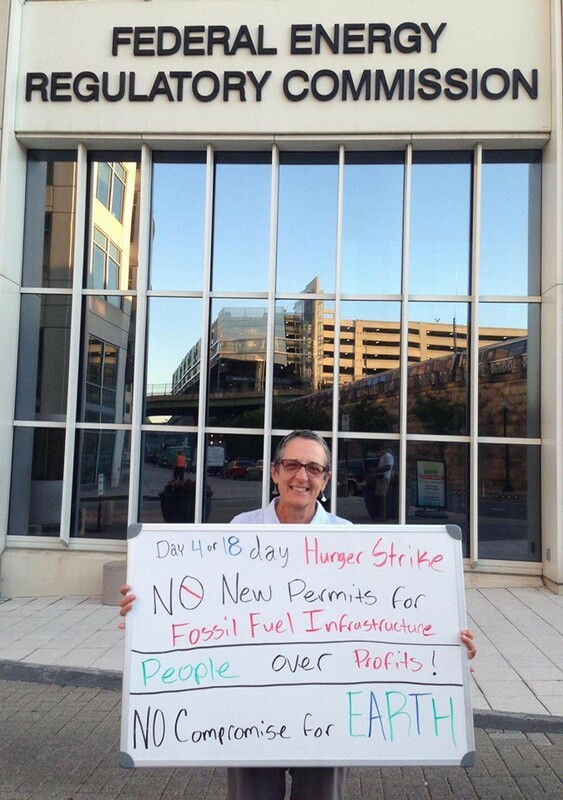 Comments about the regulations may be sent to Brigid Kenney, senior policy adviser, Maryland Department of the Environment, 1800 Washington Blvd., Baltimore, MD, 212340-1720, or call (410) 537-3084 or email brigid.kenney@maryland.gov or fax to 410-537-3888. A group of public health experts and other scientists meeting in Baltimore this month have called for a 10-year moratorium on fracking in Maryland. And if surrounding states continue experimenting on their people, animals, land, air and water, then Western Maryland counties should serve as the control group, the experts suggested, with research scientists based in Garrett and Allegany. That recommendation and much more emerged this month from the Symposium on Health and the Marcellus Shale in Maryland, held at the University of Maryland School of Nursing. 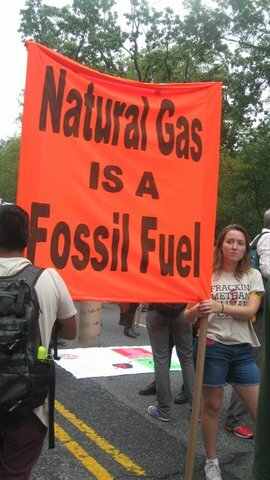 Rebecca Ruggles, director at the Maryland Environmental Health Network (MEHN), organized the conference to help answer the question confounding state officials: Can fracking be done safely in our state? The idea was to get comments on the recently completed health study — by the University of Maryland Institute for Applied Environmental Health (MIAEH) — and send them on to policymakers. The conference was co-hosted by Chesapeake Physicians for Social Responsibility and the Alliance of Nurses for Healthy Environments. From the conference report: “As public health professionals whose responsibility is protecting the health of all Marylanders, we should not pretend that we’ll know what to do in the next couple of years — we acknowledge that it may take 10 years or more to fully understand the health ramifications of hydro fracturing, and importantly, how to mitigate the health risks associated” with unconventional shale gas production. The state’s fracking health study evaluated the likelihood of public health hazards in eight categories. The conference started out routinely enough, with an overview of the health report and a panel of scientists praising Maryland for doing what no other state has done: conduct a health study, solicit comments from expert reviewers, and release it for public discussion before making decisions about fracking. The report, they said, captured well the state of the science thus far. But then came the research gaps. And stories from surrounding states. Participants were promised anonymity regarding specific comments in the symposium report, but some agreed to be quoted here. David Brown, Sc.D., a public health toxicologist, described his findings from case studies of people in southwestern Pennsylvania. There, he has measured emissions inside homes and found dangerous peaks, particularly in the middle of the night. And found people complaining of rashes, headaches, fatigue. “Are there health effects? I can lay that to rest,” Dr. Brown said. “There are. … There are exposures, and they are occurring today. There are things industry could do, but I don’t have a lot of confidence” in that happening. “Individuals will have to do their own protections,” he said. Pouné Saberi, M.D., M.P.H., a clinical assistant professor of occupational and environmental medicine at the University of Pennsylvania’s Center of Excellence in Environmental Toxicology, pointed to a lack of research on food from fracked areas (such as on the meat of hunted deer), increase in traffic accidents, emergency rooms ill-equipped to handle hazardous materials used in fracking, and a shortage of mental health providers. 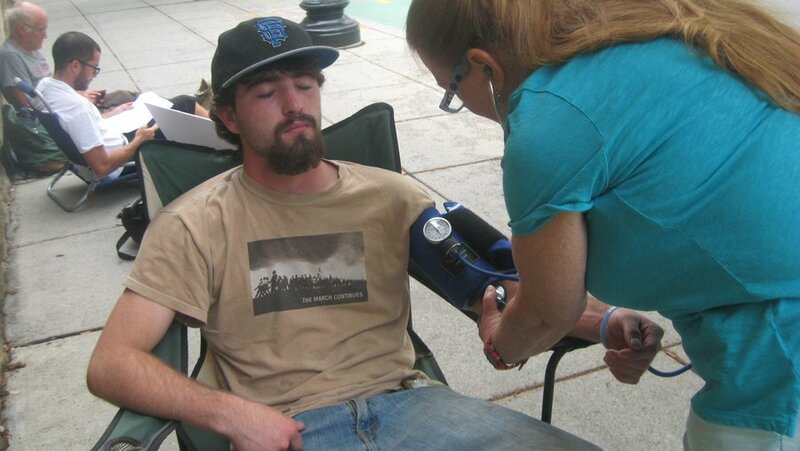 She also has heard anecdotes about an increase in the use of psychiatric medication in fracked areas. 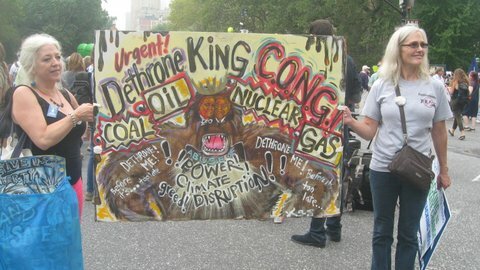 Missing, she said, is a regional health assessment from the fracking and buildout of pipelines and compressor stations. When the after-lunch small-group discussions started reporting back, a consensus quickly emerged: Don’t repeat the mistake of other states. Close the gap between science and policy by getting rid of secrecy. No secret toxic chemicals punched through aquifers and threatening soil and lungs. 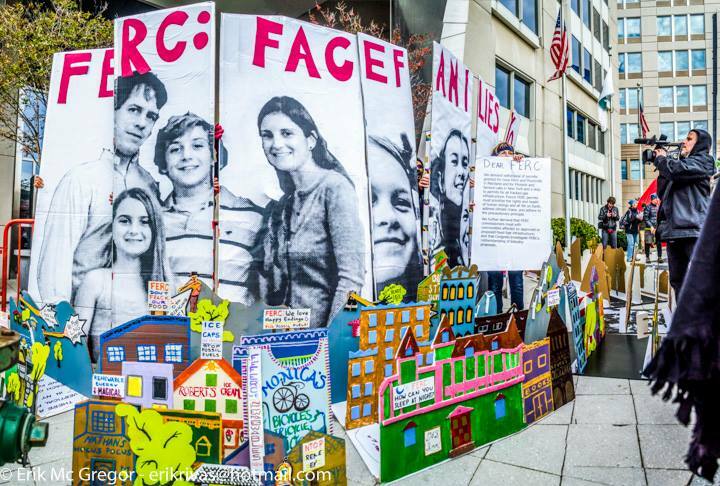 No more nondisclosure agreements, with industry buying silence from harmed families. Come up with a solution for frack wastewater. Sending it to other states with less stringent standards only outsources the problem to unprotected communities. Industry should fix the stubbornly high rates of casing failure — 6 percent right off the bat and 60 percent over a couple decades — that pose threats to aquifers and streams. Figure out the health costs in dollars. More research. More time. And if some people will be losers, that needs to be disclosed. Dr. Goldstein pressed the group: How would Maryland determine when it has enough information? And from that question came the recommendation for a 10-year moratorium. Research will continue piecemeal, and answers will not be available for many years. So, redo the health study in a decade, when much more will be known. Ann Bristow, Ph.D., a member of the state’s Marcellus shale advisory commission, then suggested that Maryland be the “baseline state” for research, with scientists located in Western Maryland doing the testing, which would create another economic engine for the two counties. “We are the comparison for your experimental states,” she said. Suddenly, Maryland’s path seemed so clear. Although, as Dr. Goldstein pointed out in a 2012 op-ed, Pennsylvanians and those in other states remain the guinea pigs. Sacoby Wilson, PhD., on a conference call this month about the state’s health report, echoed the symposium’s conclusions. Dr. Wilson, who worked on the health report and whose research focuses on environmental justice, said, “We don’t know enough information to allow” the industry to start hydraulic fracturing in Maryland. In addition, he said, data collected for the report shows a shortage of physicians and emergency personnel in Garrett County already. He also said the study was unable to assess cumulative harms from drilling — not only in Western Maryland but in shale basins throughout the state — and from pipelines and compressors that would be needed. 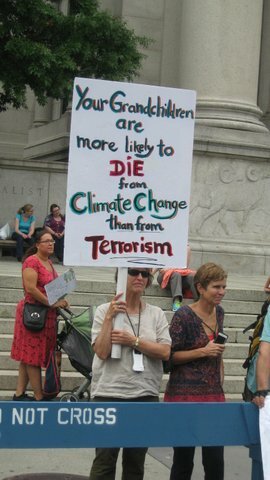 Nor did the study address climate change. Because research is insufficient, he said, Maryland should apply a precautionary approach rather than promulgate regulations. Ten years from now, energy generation, conservation, and climate change could all force a very different hand. Maryland can wait to make this decision. Tracey Eno handed federal energy regulators a check for $79 today. The money is a grant from Calvert Citizens for a Healthy Community, which for more than a year has been fighting Dominion’s $3.8 billion scheme to liquefy and export fracked gas from their Southern Maryland town — “850 feet from where children are playing, sleeping and getting on the school bus,” Eno said. 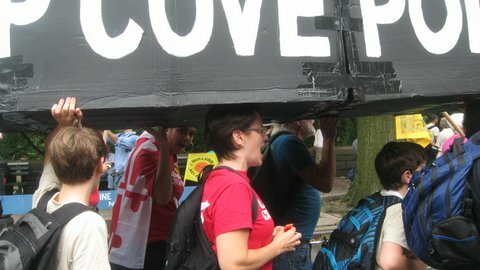 Others opposed to the Dominion facility stood near Eno, holding up small banners saying “EIS for COVE POINT” until officers made them lower the signs. FERC Chairman Cheryl A. LaFleur thanked Eno. And called the regular meeting to order. Commissioners: My name is Tracey Eno. I am a resident of Lusby, MD, from a neighborhood called Cove Point. None of you came to the FERC meeting in Lusby, so I have come to you. 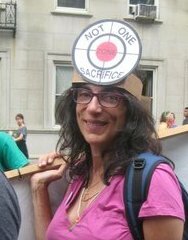 Right now, you are in danger of turning my neighborhood into a sacrifice zone for the gas industry — if you approve the Dominion Cove Point LNGexport facility without fully studying the hazards of the project. My neighbors and I have dedicated a significant part of our lives over the past year to understanding the threats this $3.8 billion project would pose to us. 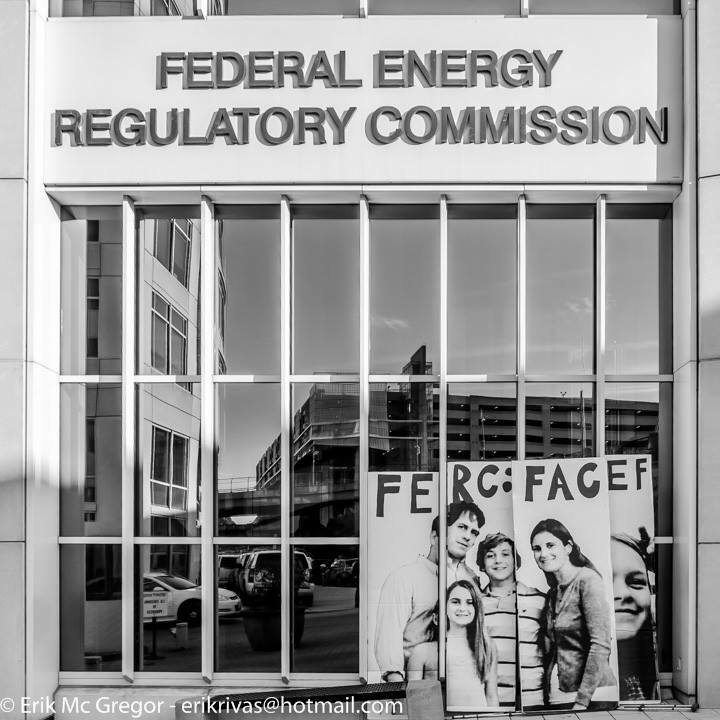 I wish I had a reason to be confident that you — FERC commissioners — have done the same. I wish I had a reason to think that you viewed as ‘significant’ the health and safety of my community, the climate, the Chesapeake Bay, and all the communities in the way of Dominion’s fracked gas exports. But, sadly, I do not. For more than a year, we have been pleading with you to provide the information on the full effects from this proposal — in the form of a comprehensive Environmental Impact Statement. This should include at minimum a basic human safety study: a Quantitative Risk Assessment. Yet, at every turn you have lowered the bar of scrutiny for Dominion, even as the evidence of threats to our communities has continued to rise. COVE POINT IS CLOSER TO PEOPLE’S HOMES THAN AT ANY OTHER PROPOSED EXPORT SITE. 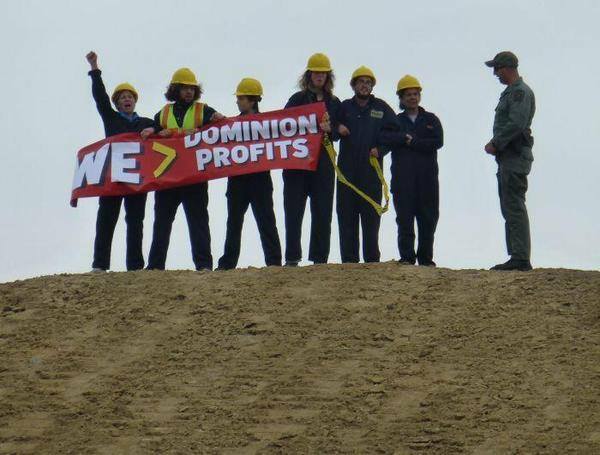 Dominion’s application grossly misrepresented the population of Lusby. They didn’t even list our town — the very town where their plant is located! They “forgot” 39,732 people who live in the surrounding area. They “missed” almost 90 percent of us. Cove Point is NOT a remote site! Inside the 2-mile evacuation radius alone there are more than 8,000 people. If built, Cove Point will be only the second LNG export terminal ever built in the lower 48. It will have the unique and terrifying distinction of being the only LNG export terminal in the history of the industry ever to be built in such a densely populated, residential area. 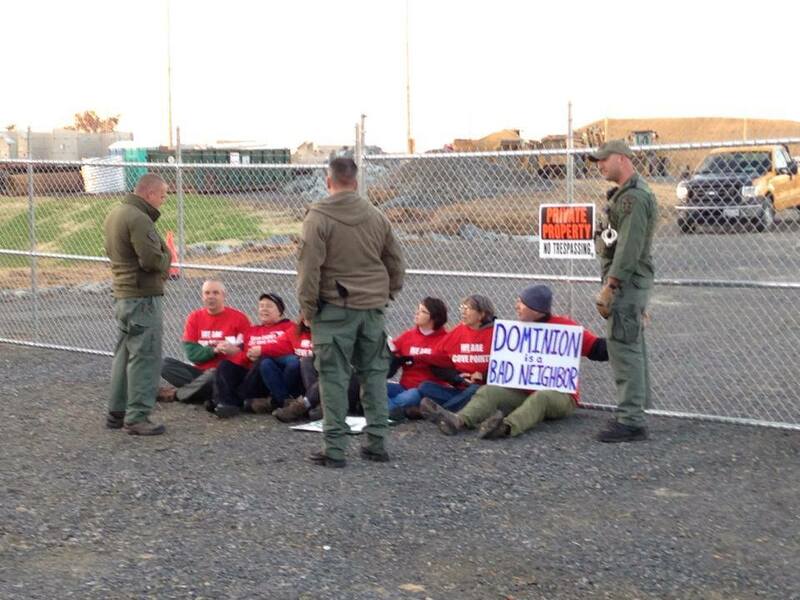 Dominion calls itself a “Good Neighbor” — because it has neighbors. It sits right across the street from hundreds of homes, and next door to a public park. A large-scale liquefaction train, filled with highly pressurized, explosive, propane refrigerant will be operating 24/7 about 850 feet from where children are playing, sleeping and getting on the school bus. Never was the need for remote siting regulations more critical than for this project. I didn’t come here empty-handed today. We know federal budgets are tight, so I brought with me a check for $79, which is a grant from Calvert Citizens for a Healthy Community. Please use it to buy a copy of the latest safety standards developed by the National Fire Protection Association: NFPA 59A: “Standard for the Production, Storage, and Handling of Liquefied Natural Gas 2013 Edition.” The 2013 edition was written to safeguard the lives of citizens living close to LNG terminals. Lusby residents were HORRIFIED to learn in the draft environmental assessment that FERC applied the 2001 federal fire protection standards. 2001 does not adequately address the dangers of LNG export equipment and processes. It fails to incorporate the lessons learned from the catastrophic explosions at a Skikda, Algeria, LNG export terminal in 2004. That disaster flattened steel buildings, killed 27 people and injured more than 70. The 2013 edition is the first to wisely require a quantitative risk assessment to assess the risks to residents offsite. We believe that you know full well that an analysis of the risks to residents at Cove Point would shock the conscience of America. Because such an analysis couldn’t help but show how much risk our government is willing to dump on the shoulders of its citizens to benefit a private enterprise. 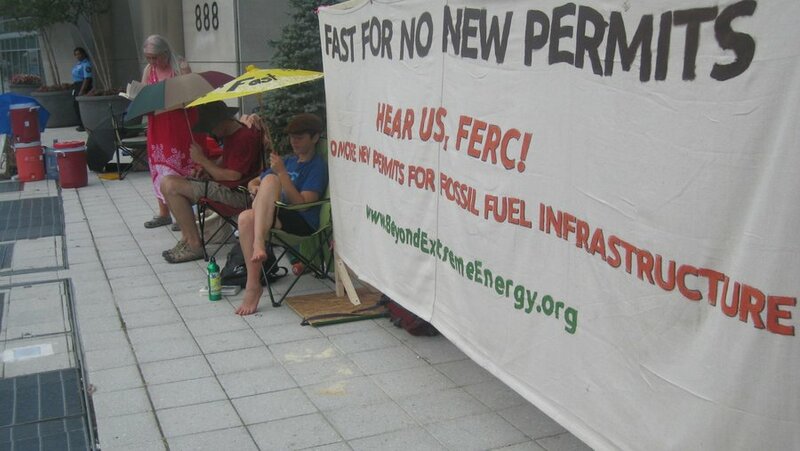 But just in case a budget issue is keeping FERC from applying the latest safety standards, we wanted to pitch in and do our part. Our lives are worth at least 79 bucks. Please buy, and use, the 2013 NFPA 59A standards. I’m not here just for my family and my neighborhood, I’m also here standing in solidarity with all those who can’t come to DC today — from the fracking fields of Pennsylvania to the playgrounds of Myersville, Maryland. We stand in opposition to the web of pipelines and compressor stations that are turning our rural, beautiful, towns into sacrifice zones as a direct result of this and related projects. Commissioners, we’re watching you. My neighbors have submitted significant technical comments. We’ve worked with allies to gather more than 150,000 public comments. We’ve testified in person to the “stand-in officials” you sent to the public meeting in Lusby in May. I’ve also brought a petition with 19,502 signatures of people across the country who are urging you to look more closely at the dangers of Cove Point. They are urging you to make the decision that serves the public good — not the gas industry’s bottom line — by denying Cove Point. I’m here to ask you to do the right thing. Show us that our safety matters to you. 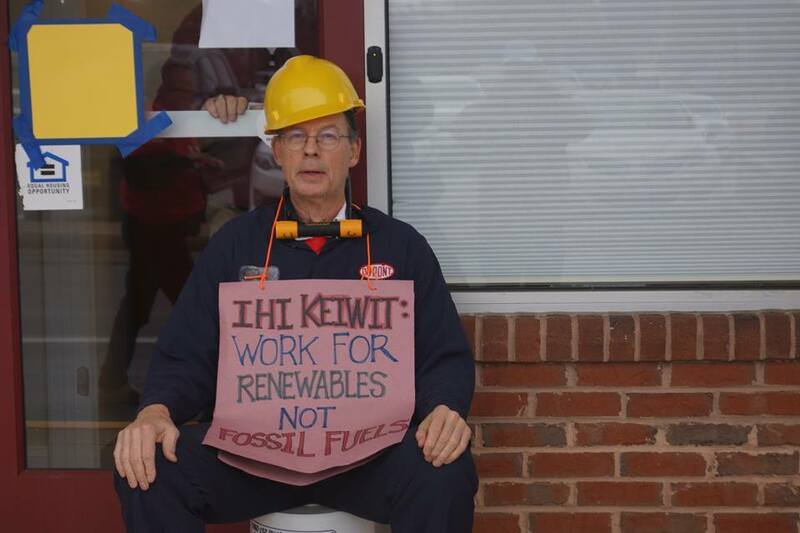 Show us that you are a regulator for the public interest, not merely a servant of the oil and gas industry. Cove Point is NOT a remote site! We know it and you know it. Please don’t put me and my Cove Point neighbors in harm’s way. Order a full Environmental Impact Statement, including a Quantitative Risk Assessment. Study ALL the facts before you consider approving Dominion Cove Point. 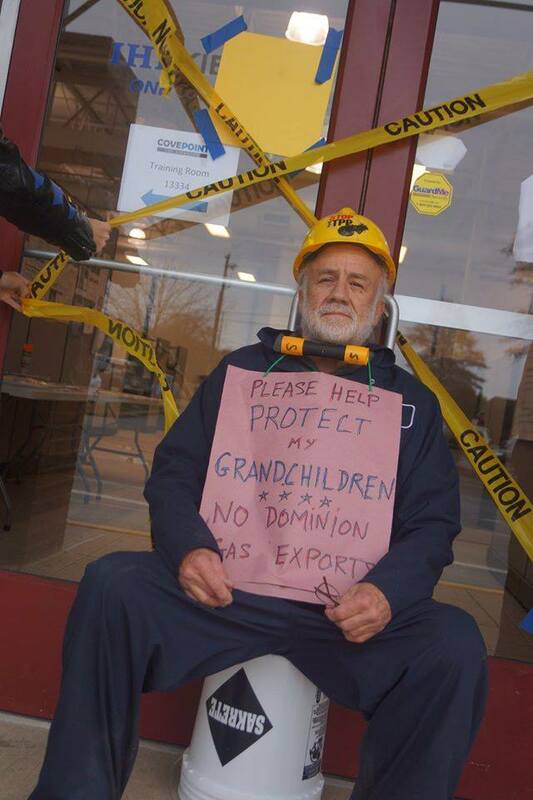 OR — just be honest — and admit that a residential neighborhood is the wrong place for dangerous LNG exports — and deny Dominion Cove Point right now.